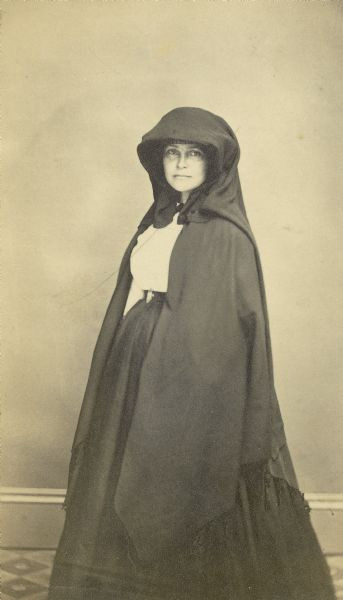 Cordelia Harvey was a philanthropist, nurse, and teacher who organized relief for Wisconsin soldiers and their children during and after the Civil War. She was called Wisconsin's Florence Nightingale as a result of her humanitarian work. Cordelia Adelaide Perrine was born in upstate New York and came with her family to Kenosha, Wisconsin, about 1840. Prior to her marriage to Louis P. Harvey in 1847, she was a country school teacher. After their marriage, the Harveys settled first in Clinton, Wisconsin, then moved to Shopiere, near Beloit, in Rock County in about 1851. They operated a country store and became active in politics. When her husband was elected Wisconsin Secretary of State in 1859, they moved to Madison. He was elected governor in 1861 and she became Wisconsin's First Lady when his term began in January 1862. Three months later, after the battle of Shiloh on April 6-7, 1862, Governor Harvey led medical and public health experts to Tennessee to inspect the condition of wounded Wisconsin soldiers. Their goal was to learn how many hospital staff and medical supplies should be collected on the home front and sent South. During this trip, Governor Harvey accidentally drowned in the Tennessee River. After a brief period of mourning, Cordelia Harvey picked up where her late husband had left off. She was appointed the official "state sanitary agent" for Wisconsin troops by Gov. Edward Salomon and went to the South herself. For the next several months, she visited Wisconsin soldiers in military hospitals along the lower Mississippi River and was instrumental in bettering their conditions. Besides organizing shipments of supplies and staff, she became convinced that many lives could be saved if sick and wounded soldiers were removed from the hot, damp Southern climate and allowed to recover in the North. In 1863 she visited Washington, D.C., and asked President Lincoln to support this idea. He was initially skeptical, fearing that soldiers would desert if allowed to return home. Harvey eventually prevailed, and President Lincoln authorized the Harvey Army Hospital in Madison. This institution proved to be so successful that similar hospitals were opened in Prairie du Chien and Milwaukee. Harvey made Vicksburg, Mississippi, her headquarters for the rest of the war. She spent much time traveling to raise money, recruit volunteers, and ship supplies to the front. At the close of the war, Harvey Hospital was converted into a home for soldiers' orphans. Cordelia Harvey served as superintendent until the state took over the institution in 1867. Nearly 700 children lived there in the decade following the war. In 1876 Cordelia Harvey married Rev. Albert T. Chester and moved with him to Buffalo, N.Y., where she taught school until his death. She then returned to Wisconsin and died on February 27, 1895, in Clinton. Both she and her husband, Louis P. Harvey, are buried at Forest Hill Cemetery in Madison, Wisconsin. Written by E.B. Quiner in his book, "Military History of Wisconsin" (Chicago, 1866). Originally published in the Wisconsin Magazine of History, vol. 76, no. 2 (1992).